LandrumHR, a professional employer organization (PEO) company in Pensacola, FL, is proud to announce that David McCullough is their new Chief Technology Officer (CTO). David is an experienced executive, having held leadership positions within successful, growing companies for more than two decades. He has led various organizations through extended periods of change while maintaining focus on both internal employees and external customers in order to ensure that they remain engaged and satisfied. 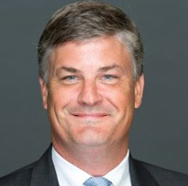 Britt Landrum III, President at LandrumHR, says, "David has extensive experience in the technology and service sectors with particular emphasis on the areas of strategic development, process improvement, implementation, client relationship management and market development. We are very happy to have been able to attract him to our company." Active in several business and professional organizations, David has served on the boards of several technology and service organizations. He is also very much involved in the activities of the Atlanta chapter of Georgetown University's Woodstock Business Conference. David has also shown a passion for his faith, his family and his community. He has served as Grand Knight and Trustee for Council 13217 of the Knights of Columbus at St. Peter Chanel Catholic Church. He has also served as Director of the Catholic Business Cafe, a monthly business-networking event in the metro Atlanta area. In addition, David is the former Cubmaster, Assistant Cubmaster and Den Leader for one of the largest Cub Scout packs in the state of Georgia. He has previously served as President of the Pope Junior Greyhound Lacrosse Association. He is currently on the Parish Pastoral Council of The Catholic Church of St. Ann in Marietta and serves on the Advisory Board of the Catholic Charities Atlanta Leadership Class where he is a founding member and previous Chairman. Active in several non-profit organizations, he and his family enjoy getting involved in making a difference for those in his hometown of Atlanta. David has extensive experience in the HRIS/payroll technology space as both a solutions provider and within staffing and PEO businesses where he held several executive level positions. David’s focus within the technology space has included operations, C level sales, employee relations, business process improvement, and revenue stream cultivation. Thus, his skills and experience are very much appropriate for the PEO, Staffing, and Consulting divisions. LandrumHR offers a human resources solution that is tailor-fitted to each particular business. Services provided include payroll, risk management, medical benefits and retirement plans, staffing and recruiting, business development, HR consulting, and more. Interested parties are encouraged to contact LandrumHR today.